As I was saying in Castletown and Rathkeale yesterday, we are half-way through Lent, half way on our journey to Easter. Once again this year, I am going to have two Easter celebrations … last year, after our Easter celebrations, I joined the Greek Orthodox celebrations of Good Friday and Easter in Thessaloniki, and this year I am planning to do the same in Crete. 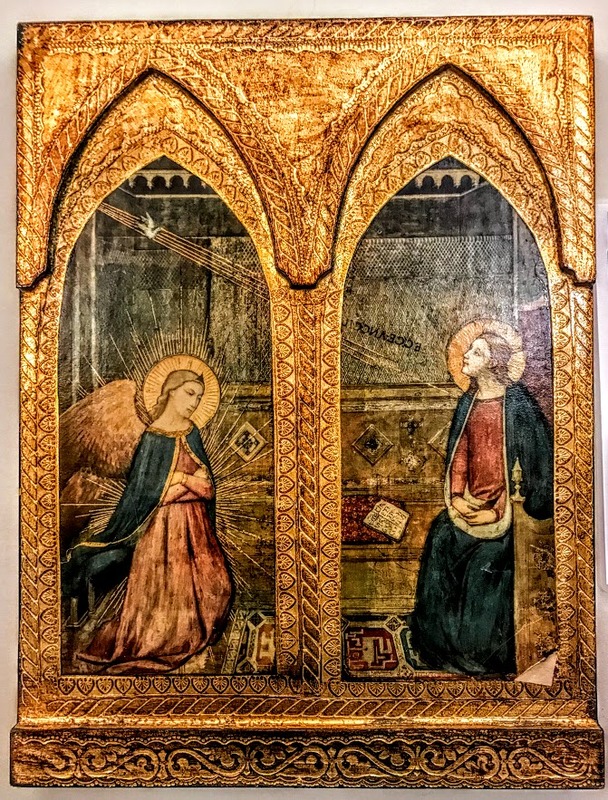 As I looked at a fresco of the Annunciation in one church in Thessaloniki on Good Friday last year, I realised how important the Feast of the Annunciation is in the Greek Church, where it is one of the 12 Great Feasts of the Church. It is so important in Orthodox theology that the only time the Divine Liturgy may be celebrated on Good Friday, or ‘Great and Holy Friday,’ is if it falls on 25 March. This fresco of the Annunciation in that church was also in sharp contrast to the plaster-cast statue images of the Virgin Mary we often see in churches in Ireland: her demure robes of white and blue hardly portray the strong Mary in the canticle Magnificat, the strong Mary who stands by the Cross when most of the disciples have run away, the strong Mary of the Pieta. 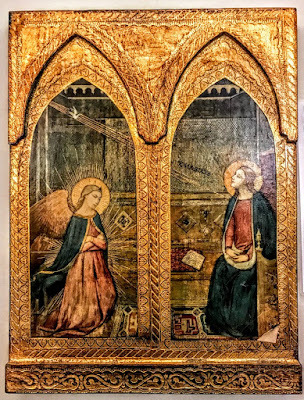 The canticle Magnificat, the Mary who stands by the Cross, the strong Mary of the Pieta, all make the connection between the Annunciation and Good Friday and Easter morning. The date of the feast of the Annunciation, 25 March, was actually chosen to match the supposed historical date of the Crucifixion. This was to underline the idea that Christ came into the world on the same day that he left it: his life formed a perfect circle. In other words, 25 March was both the first day and the last day of his earthly life, the beginning and the completion of his work on earth. Both events were understood to have happened in the spring, when life returns to the earth, and at the vernal equinox, once the days begin to grow longer than the nights and light triumphs over the power of darkness. Fans of JRR Tolkien and the Lord of the Rings cycle among us this morning know that the final destruction of the Ring takes place on 25 March, to align Tolkien’s own ‘eucatastrophe’ with this most powerful of dates. When Good Friday fell on 25 March 1608, John Donne marked this conjunction of ‘feast and fast,’ falling ‘some times and seldom,’ with a well-known poem in which he draws on the same parallels found in those mediaeval texts and images. In Michelangelo’s great sculpture of the Pieta, the weeping Mary is bearing on her lap the body of the Crucified Christ who has been taken down from the Cross. When I see images of the Pieta, I imagine the Virgin Mary as a mother who knows the fears and lost hopes of so many women: the women who see the death of their own children; the women who hope to be mothers and grandmothers, but never are; the women who see, experience and feel violence and violation at first-hand in their own lives; the women whose own grief is hijacked by others for their own agendas. The Virgin Mary’s ‘Yes’ at the Annunciation is her yes, is our yes, is the ‘Yes’ of humanity and of creation, not only to the Incarnation, but to the Crucifixion on Good Friday, and to the Resurrection on Easter Day, and all the hope for the future that Easter brings.